Back when I was putting games on the computers in my lab, I noticed that I had a bunch of French SNES games amongst my collection. Oddly, the kids don’t seem too interested in them; most of them are RPGs and those require a greater commitment of attention and time than they’re willing to make. Around that time, too, Jen mentioned that she had a craving to play Earthbound. But although I found French Zelda and Soulblazer, there’s no such thing as French Earthbound. I did a fair amount of looking, too! This post is meant to serve as a scolding. Hey, Francophone Africa: this is why French is a bad play. Translations exist for Spanish and even German! French translation seems to have been started, but then stalled. This is for Mother 3. This is the blog post I wanted to write two or three weeks ago, when I was still hip-deep in it, but it got pushed to the side. My postmate Cristina inherited this Books For Cameroon project from our predecessor, a lady named Wendy. Cristina recently succeeded in bringing a French bookstorm to Cameroon. 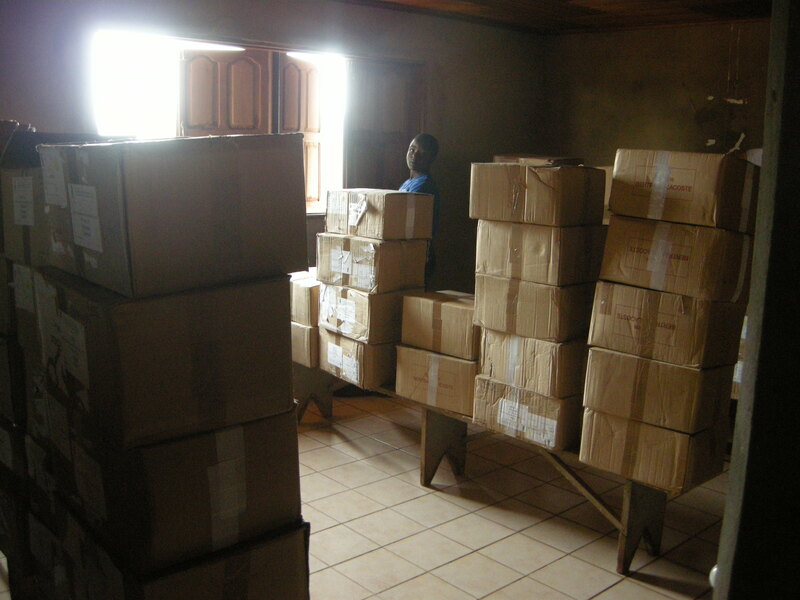 Over 21000 books, which may not seem like a lot but wait until you are faced with over 450 cardboard boxes of books, packed by a French NGO according to subject, to be divided amongst 30 different libraries. Nice books, don’t get me wrong, but.. so many of them. I was called upon by the forces of good, namely Yaya and Kevin (not depicted). Cristina had been spending a lot of time working on spreadsheets deciding how books needed to be distributed, taking into account size of library, likely user population, levels of students available nearby, etc. 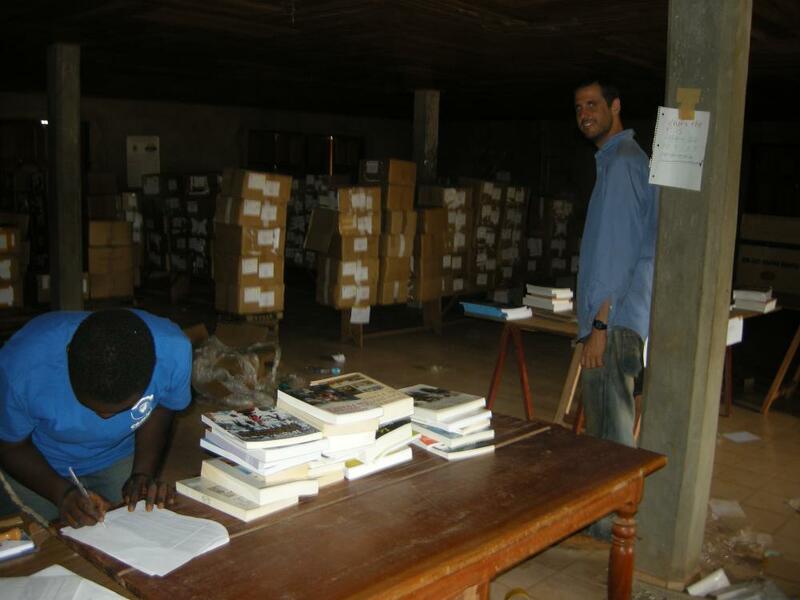 We needed to transform boxes of books arranged by title into boxes of books arranged by library. Yaya and Kevin thought it might be possible to use some of those informatique skills I’m rumored to have to transform the various kinds of inputs into a different kind of output: a list, organized by box, of how many of each book needed to go to which libraries. 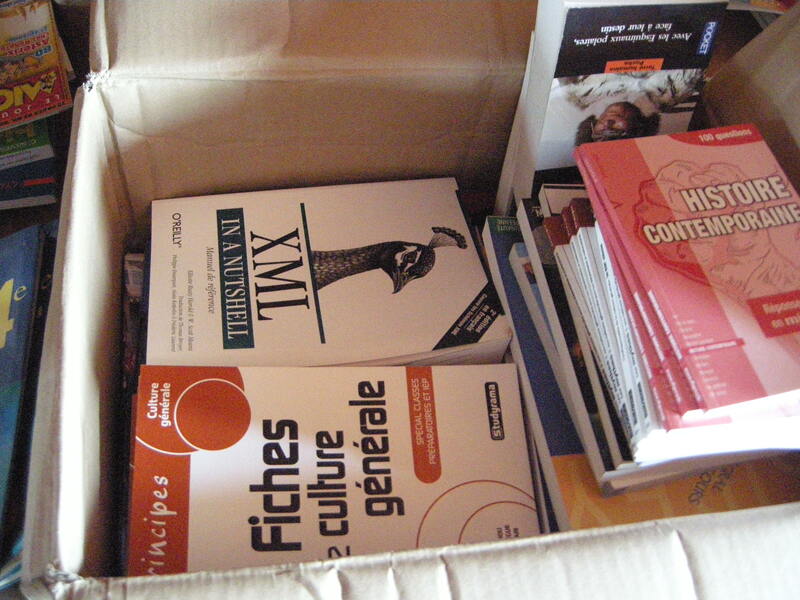 But time flows like a river, and history repeats..
Josiane in the "stacks", looking for a box to unpack. 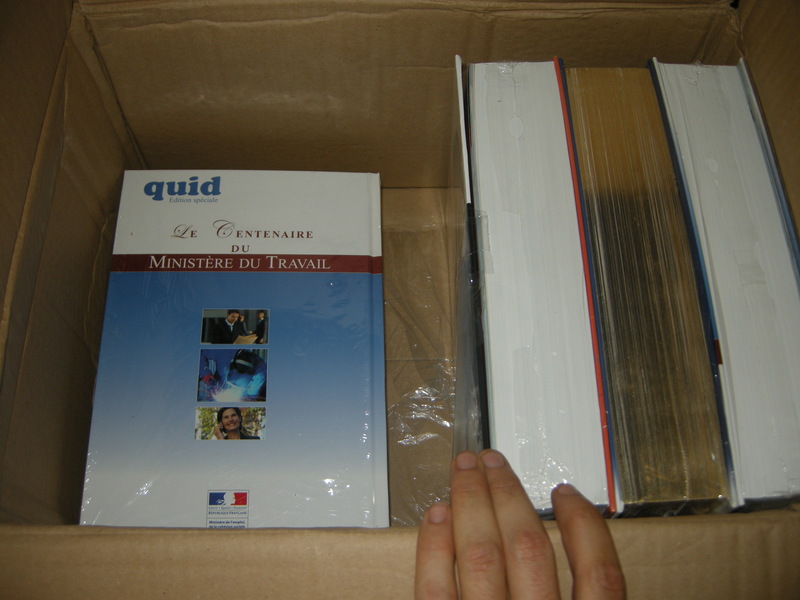 Quid is apparently a French one-volume encyclopedia, very text-heavy, sorted by subject (not alphabetically). No idea why they sent a box full of "XML In a Nutshell".. Nothing is ever easy in Cameroon. At best it’s inconvenient. This is one of the things you learn how to do in Cameroon: lower your expectations, and cope. This is a skill that is adaptive for an individual but toxic for a society, because what impetus is there for Cameroon to improve or thrive when nobody complains? Cristina is a wizard genius scientist for pulling off this project as well as she did. She found a French association, ADIFLOR (something like "Association pour la diffusion international de la francophonie par les livres, oeuvres et revues") who give away books. Nice quality books too, much nicer than what you find in-country. We spent a little while wondering amongst ourselves where the books came from and why we were getting them (as we generally can’t have nice things). Leading theory is that these are misprints and discards convening to outdated school curricula. 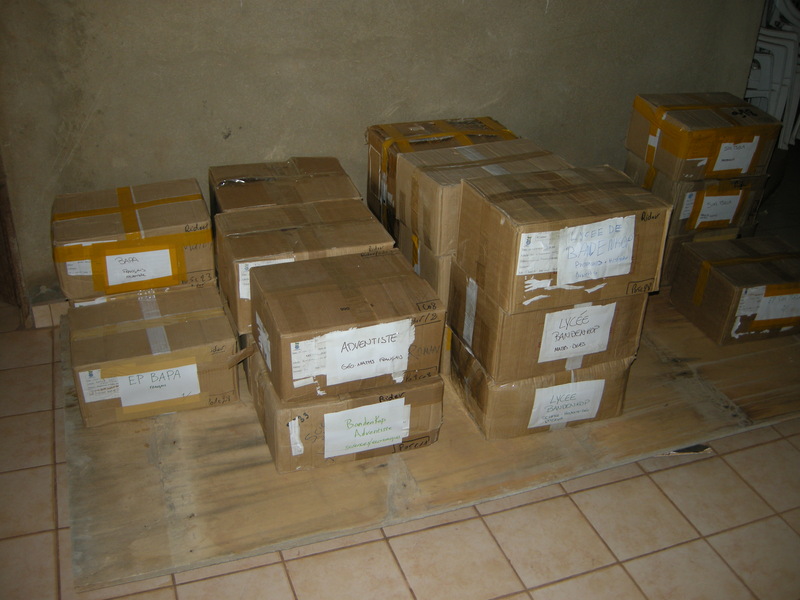 Anyhow Cristina did some fundraising to get the money to pay to transport the books to Cameroon, and ADIFLOR has a "special relationship" with Cameroon, so between them and the Lions Club, the books popped right out of customs and drove up here on a truck. After I was drafted by the volunteers doing the sorting just a thirty-minute walk away, I jumped in, banging out code and solving problems with Kevin until late at night. It was perhaps the most fun I’ve had in this country, a harsh reminder that the thing that I love to do most is not that thing for which I volunteered. Different Volunteers cope in different ways, some coming up with worthless make-work projects based around their skillset, some (myself) just drinking way too much and daydreaming about the days when they can finally have job interviews and resumes. 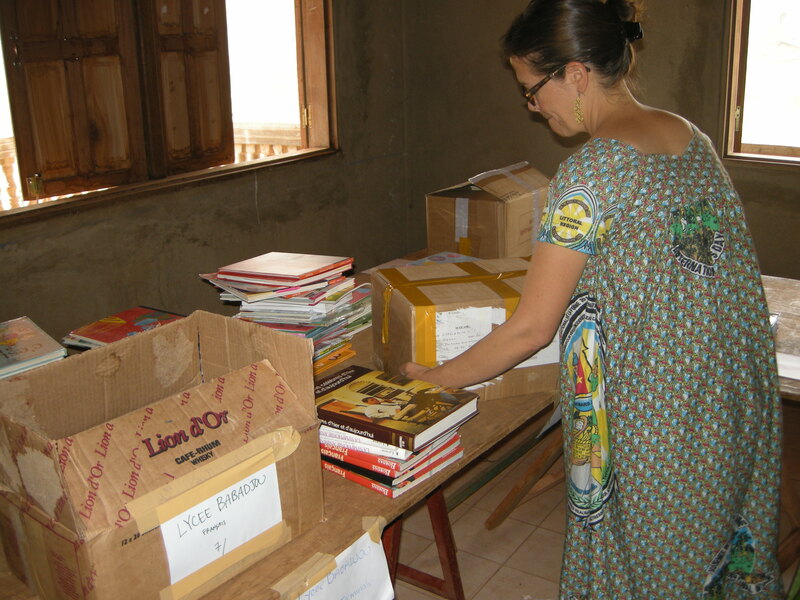 Cristina, packing up sorted books. The technical challenges are, as always, fairly minor when compared to the auxiliary challenges — the packing list being sent to us as a PDF, for example, or how Cristina’s spreadsheet didn’t match up exactly to the packing list. We supported, of course, and when we were good, we were amazing — a book-sorting, box-packing Volunteer machine extracting energy from music and late-night bad decisions. Cristina said that she didn’t really find a lot of guidance on the Interwebs around this kind of project or how to approach it, so let me give you a few pieces of advice. First, verify that all the boxes are there before you start. Our shipment got tangled up with a shipment for the Lions Club, and we got some of their boxes and I bet they also got some of ours. Some boxes are just completely MIA but it’s hard to know if they’re there or if we maybe just repacked them already. Second, the spreadsheet is a good idea but I’m not completely sure what benefit it provided. If we hadn’t had it, we would have just opened boxes and partagéd books fairly evenly. Is it optimal? No, but it’s a lot easier. 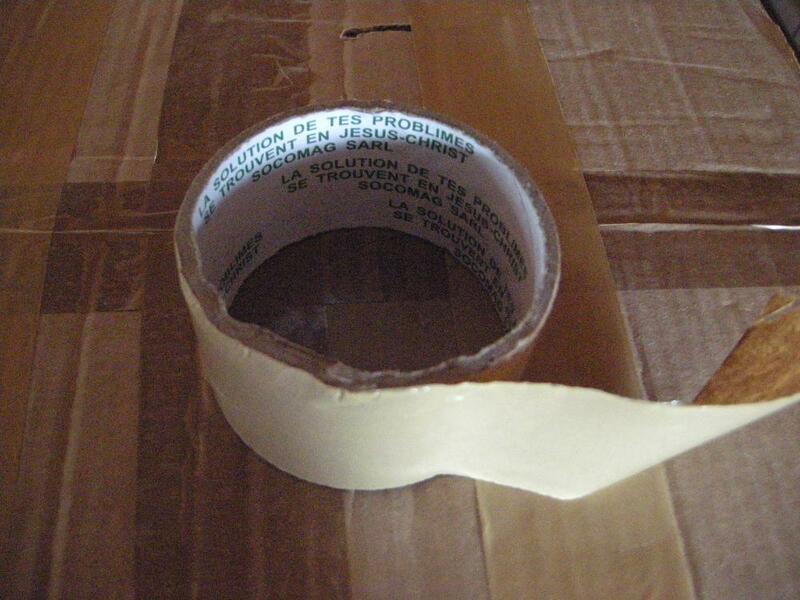 Thirdly, get lots of cardboard boxes ready. You can never have too many cardboard boxes. 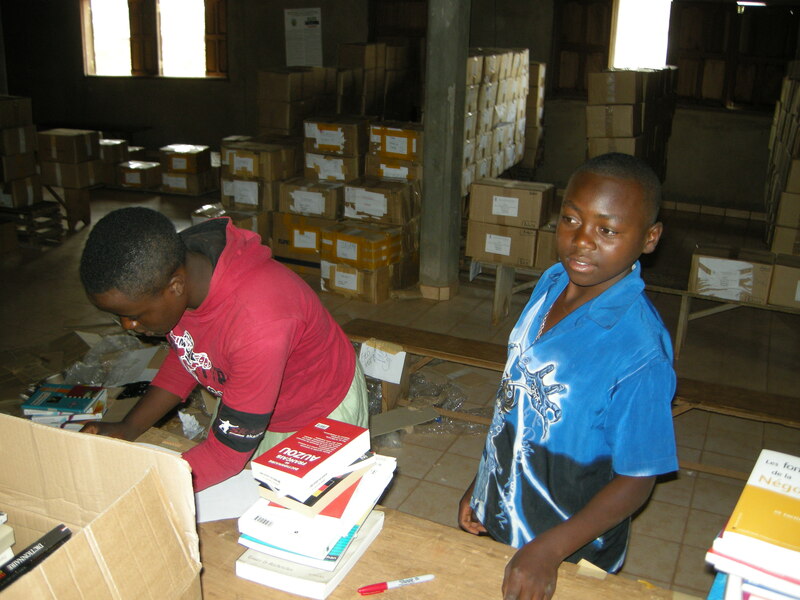 Josiane (the one who has a crush on me) followed me to the book sorting, and she was actually kind of helpful. Brondone, my neighbor’s kid, was less helpful.